Hi, I am R, S’s husband. yarn I contacted one of S’s friend and knitter ( Also a WoO member). have everything organized and available to be looked at transported. enjoy your organization, and wanted to share her yarn with the group. I did not personally know S; I only joined the Weavers guild last fall, and there’s many members I have yet to meet. Nevertheless, this e-mail hit me right in the heart. When you make something with your hands, you use not just materials and tools but also the most precious resources any of us have — our time and energy. Inevitably, something of ourselves is left in our work. A stash is personal because it reflects our plans and dreams and wishes and hopes and possibilities, an investment of our future time and energy. S’s yarns and books and half-finished projects aren’t just objects; they are a part of and reflection of her. 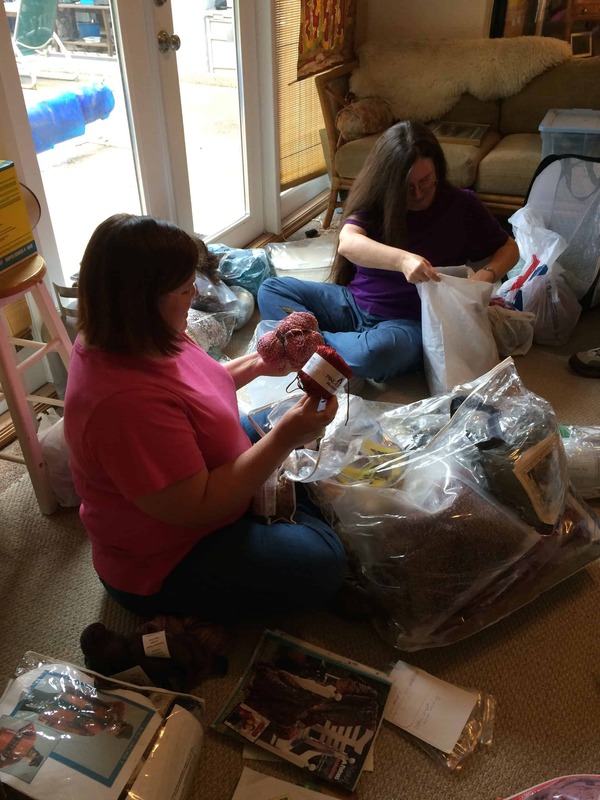 Nancy and me sorting through S’s yarn and projects. S was a talented and organized knitter. Her projects were mostly sweaters: pieced together, knit in the round, colorwork, cardigans. She wasn’t stuck in any kind of color rut. Her projects spanned every hue of the rainbow. Most of her yarns were high-end, but she wasn’t afraid of novelty yarns. She had a wonderful sense for combining colors and textures into her work. Like many of us, she didn’t like finishing work. I came home with 10 WIPs; Nancy took home many more than that. Since I’ve never made a sweater before, I came home with the projects that only needed blocking or minimal seaming. Nancy took home projects that still need collars and cuffs or that were knitted in pieces. In addition to the WIPs, we left with a medium-sized packing box of kits. These were projects that had pattern, needles, and yarn packaged together but S had not yet started knitting. We had another, slightly smaller box, of WIPs that need substantial knitting. We also left with three large boxes of yarn and a milk crate of books and magazines. One of the WIPs I brought home is a particularly special project. It is a shawl which E, S’s best friend, was knitting for S & R’s daughter. E passed away two years ago, and the half-finished project came to S. S finished the knitting, but hadn’t blocked it yet. I will block it and return it to R so he can give it to his daughter. Over the next several months, Nancy and I (and anyone else we can press into service) will be finishing the rest of the WIPs. In January, we will bring them to Distaff Day and donate them to Project Warmies, a local charity that distributes warm items to several local shelters. R gave us bookmarks, leftover from the funeral service, with a picture of S and a short obituary. Project Warmies likes to have a little information about each donated item they receive, so we will include those bookmarks with each project. The Guild will use the less expensive, big box yarns to make Kumihimo disks or other giveaway demos. The Guild does many demos throughout the year, often at schools. We estimate that we will go through 1,000 homemade Kumihimo disks this year! The kits, WIPs that need substantial knitting, remaining yarn, and books will all go into the Weavers of Orlando auction held in August. R seemed happy with the plans for the yarn and projects. S wanted everything to benefit the Weavers of Orlando or to go to a good home, where the items would be appreciated. We will do our best to honor those wishes. As I read the e-mail then sorted through S’s yarn, I realized this: there is no “if.” We are all yarn. Every time we buy a skein for our stash, or spend time knitting, crocheting, spinning, weaving, dyeing or otherwise crafting with fiber, we incorporate the yarn into ourselves. We eschew other possibilities and become a yarn crafter, a yarny, a fiberista, a maker. Time drips through our fingers in the form of stitches, warp and weft, roving smoothed into yarns. As often as we talk about SABLE (Stash Acquired Beyond Life Expectancy), we know, somewhere deep down, that someday when we are gone (hopefully many years from now) our loved ones will be crafting an e-mail like the one above. Someone who never knew us will be looking through our stash and our half-finished projects. What will she learn about us? Really thought provoking post. What a wonderful thing you are doing, I’m sure any knitter would be proud to have their stash passed on in such a way. That’s an absolutely wonderful thing that you are doing. I would love to think that someone would collected up my WIPS and finish them when I’m gone. Very touching. I’m sure S would be proud. Also love the last paragraph – it’s so true. Perhaps we are all not 1 type of yarn but a collection of what we find in our stash. Very moving, I think it’s really heart-warming to think of these yarns going to new homes or charities and projects being continuinued in someone’s memory. I love the story here. This is a beautiful post about people behind the yarn and its totally perfect. Thanks for sharing. What a lovely post. And what a wonderful thing to do with the WIPs. Lovely post. Yes, what does our stash say about us? You (and your friend – glad you have help!) are being privileged with a rare and wonderful gift. Thanks for sharing it with us!